Doug Oliver started losing his eyesight when he was 32. He describes his vision then as like “a honeycomb of blind spots.” He could not discern his wife’s face while walking alongside her; he could not read under normal lighting; he could not exercise. Eventually, he almost hit two pedestrians in a crosswalk while driving into town. Doug was treated with adult stem cells taken from his own bone marrow, and his vision was gradually restored. Many others like Doug are currently being treated using ethically-derived, non-controversial adult stem cell transplants, which do not require the destruction of young human life. In fact, well over one million patients worldwide have been treated using adult stem cell transplants. In 2014 alone, nearly 20,000 bone marrow and umbilical cord blood transplants were performed in the United States, according to the national Health Resources and Services Administration’s Blood Cell Transplant Report. Stem Cell Research Facts is a project of the Charlotte Lozier Institute since January 2015. 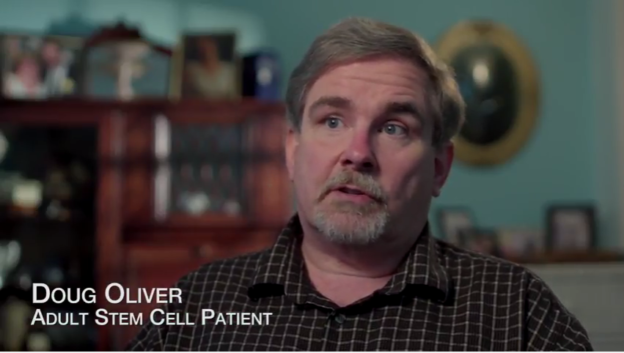 CLI plans to continue producing inspiring videos like Doug Oliver’s to raise awareness about the life-saving, research-based, and ethical treatment option of adult stem cell transplants.